Topics: Download, Certificate, Dealer Wanted, and Color Charts. Age: It went live on December 27th 2001, making it over 16 years, 3 months old. 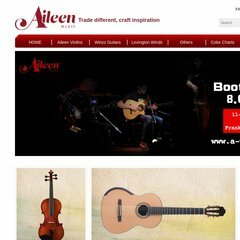 a-violin.com Light and semi-rigid cello cover with EVA foam materails (BGC1600 ..
a-violin.com Advanced Violin in Violins catalog: Back and side with flame, hand ..
59 users visit the site each day, each viewing 2.00 pages. A-violin.com's server IP number is 174.123.159.93. dns3.zgsj.com, and dns4.zgsj.com are its DNS Nameservers. It is hosted by Theplanet.com Internet Services Inc (Texas, Houston,) using Apache web server. The server is slower than 82% of measured websites, at 4992 milliseconds.